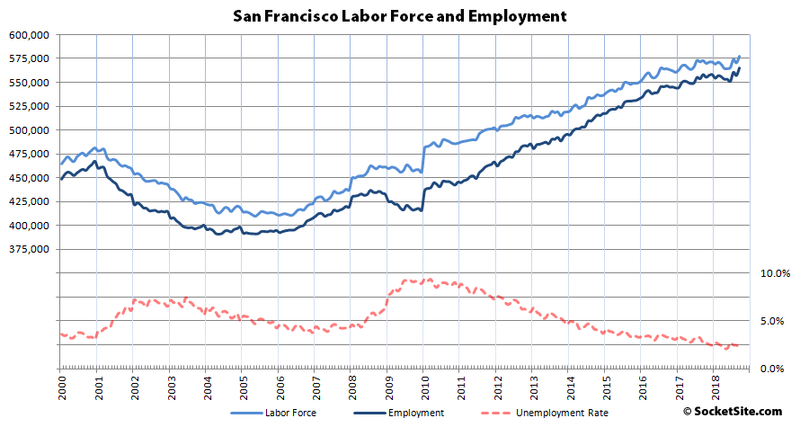 Having dropped in August, the number of people living in San Francisco with a job increased by 7,900 over the past month to a record 577,500 in September while the labor force increased by 6,900 to 577,500 and the employment rate dropped from 2.4 percent to a near-record 2.2 percent having hit 2.1 percent in April. And as such, there are now 128,000 more people living in San Francisco with paychecks than there were at the start of 2010 and 6,900 more than at the same time last year versus a year-over-year increase of 11,800 in September of 2017 or a year-over-year gain of 17,600 in September of 2015. 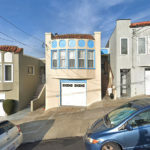 In Alameda County, which includes the City of Oakland, the estimated number of people living in the county with a paycheck jumped by 13,400 to 836,100 – which is 143,300 more than at the start of 2010 and 11,000 above its mark at the same time last year – and the unemployment rate dropped to 2.8 percent. Across the greater East Bay, total employment increased by 22,500 in September to 1,391,300, which is 18,500 above its mark at the same time last year, and the unemployment rate dropped to 2.8 percent. Up in Marin, the number of employed residents increased by 2,500 to 141,400, which is 3,200 above its mark at the same time last year, and the unemployment rate dropped to 2.3 percent. 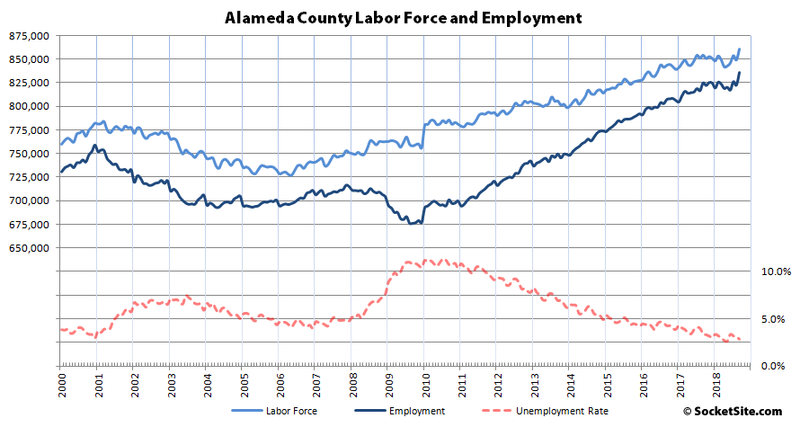 And down in the valley, employment in San Mateo County increased by 6,400 to 450,200 in September, which is 5,600 above its mark at the same time last year, and the unemployment rate dropped to 2.1 percent, while employment in Santa Clara County increased by 11,500 to 1,041,900, which is 26,600 more than at the same time last year, with an unemployment rate of 2.4 percent and a blended unemployment rate of 2.3 percent across Silicon Valley overall versus 2.2 percent this past April. Nine in 10 workers in [Silicon Valley] make less than they did in 1997 after adjusting for inflation, according to a new report. The study shows a pattern of income inequality on tech’s home turf that’s even worse than the national average. Authors of the report point to an increasing concentration of company profits going toward the salaries of a select few…Middle-class workers in Silicon Valley are being hit the hardest by stagnating wages, seeing their earnings go down by as much as 14 percent. Emphasis mine. If your standard of living is being driven down over time, what point is there in being employed here versus being employed in some other part of the country with less competition for housing? Hence the domestic net out-migration from the Bay Area and the slow Bay Area population growth. Phoenix and Seattle are among the fastest growing large cities in the US. People of flocking there. Many from the Bay Area. 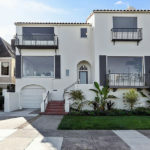 Medin homwe price in SF is 1.6 million. In Seattle it is 810K and the slaraies are almost the same in both cities. Phoenix has a large growing job base. Salaries are not as good as in SF or Seattle but the median home price is 250K. Making for a very affordable housing market. The Bay Area is pricing itself out of being a competitive metro to booming areas like Phoenix and Seattle. Companies can’t afford to locate or expand here because of the housing situation which results in an inability to attract talent. “Fastest Population Growth” is not a category that the Bay Area is every going to win, nor is it any measure of success. We still have the best economy in the country, if not the world. I’ll use that. We have 50,000+ homeless in the SF region. Don’t get me wrong – SF is a great place – but a lot of the streets in SOMA stink of poop and pee. Daily. According to 311 we get 4x as many complaints for that offense in SF as they do in NY and NY is a lot bigger. ‘best economy’? Probably, but ‘worst land use policy’? Definitely. I agree with you there. SF’s city government is incompetent and corrupt when it comes to homelessness programs. But it’s really our fault. We vote them in. In SF’s “defense”, it’s a huge regional problem. San Jose is maybe worse. I agree that San Jose’s homeless problem is probably worse. There, the homeless tend to reside in creek and river beads and so aren’t so visible, where in The City, they’re sprawled out on the sidewalk injecting heroin, smoking crack and/or crystal meth in full view of everyone. In SF’s defense, the ratio of homeless-to-population has stayed flat while in Los Angeles it’s soared over the past decade, so The City is actually doing some things right. Did you know that the program Gavin Newsom started that gives homeless people a one-way bus ticket to leave San Francisco and reunite with relatives that can take care of them is still in place? I didn’t until I read about it yesterday. That’s one of the reasons that the cycle dynamic is so dominant here, price momentum affects everyone. A rising tide (of property values) raises up everyone and a sinking tide drags everyone down. But only a very very small number of people are highly paid superstars. Even in SF, most don’t work in tech, most startups outright fail, even ones that survive, many don’t deliver exceptional liquidity and even then the payouts tend to be very top loaded towards exec/early employees.